INFINIDAT started with the expectation that in the coming decade, multi-petabyte computing will be pervasive. If we could solve the economic challenges that come with storing and protecting data at scale, we would make a real impact on customers’ businesses. Our strategy is working. We are coming off our 18th successive quarter of revenue growth. Since our first product shipment in summer of 2013, we’ve established a happy, loyal customer base that accounts for a large percentage of our revenue with their repeat business. For us, this is a very strong signal that we’re solving customers’ problems for primary storage. Now it’s time we do more. Customers told us from the beginning that cost reductions in IT infrastructure weren’t happening fast enough to offset the growth of data. Add to that the complication that “best-of-breed” storage products weren’t scaling for multi-petabyte computing. We tackled that with the InfiniBox, our industry leading enterprise storage solution providing best-in-class availability, performance, and capacity at scale. We also heard that data pain points extend beyond primary storage—backup, data continuity, disaster recovery, and cloud storage were all issues to be addressed. With this feedback, and a strong technology foundation, we set out to expand our portfolio and help to address more of the data life cycle. 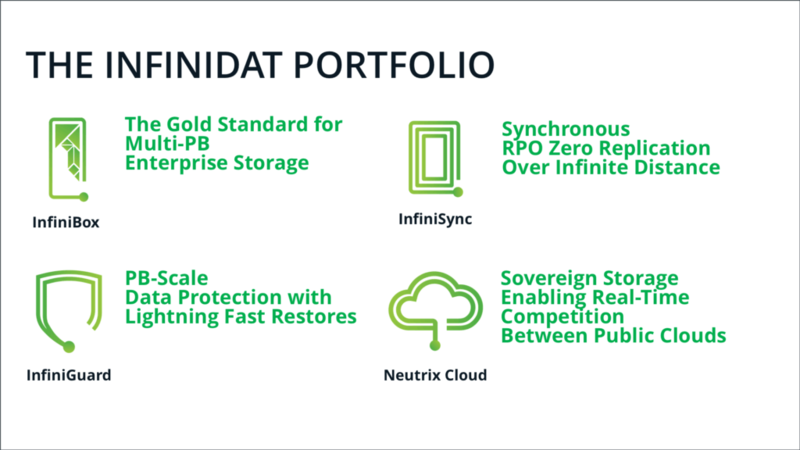 Today marks the official launch of a new INFINIDAT product portfolio: InfiniBox F6212, InfiniSync, InfiniGuard, and Neutrix Cloud. 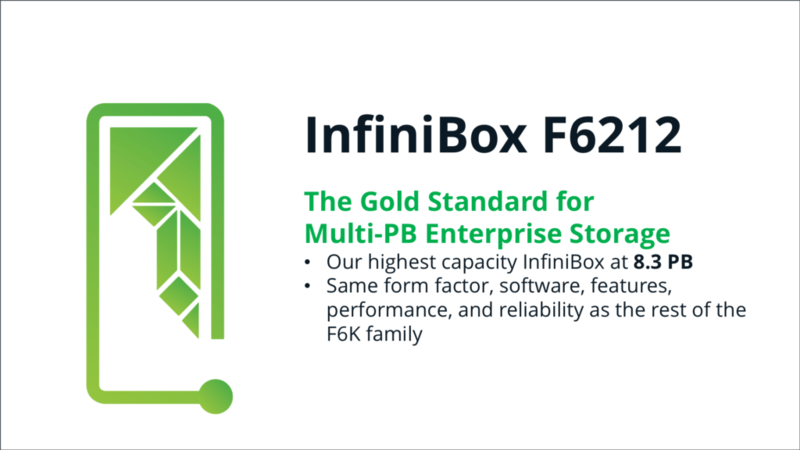 Also in this latest product portfolio release is a new InfiniBox model, F6212—a new model focused on addressing customer demand for storage solutions built for analytics, deep learning, and industrial IoT use cases. The F6212 model sports 8.3 PB of capacity and runs the same proven software with the same features, performance, and reliability you love about the InfiniBox product family. Disasters happen—some little, some big. 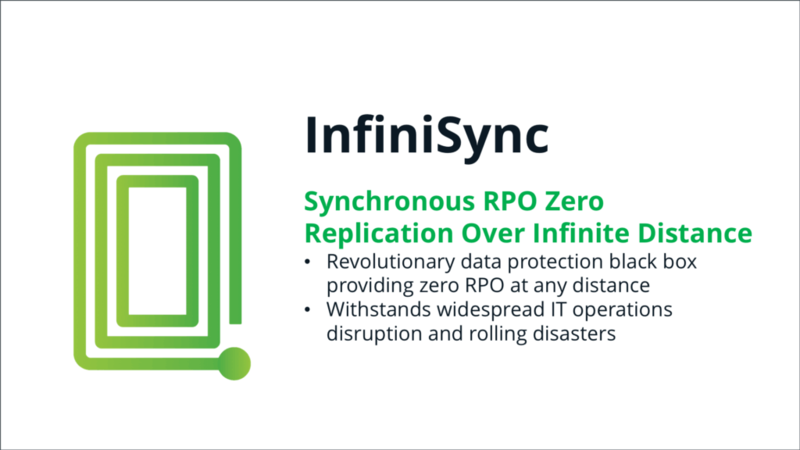 While the typical approach to business continuity is to build out an array of backup data centers, replicating data synchronously and asynchronously across them to the disaster recovery site, InfiniSync is a better solution. Our solution for business continuity is to use asynchronous replication between two sites while syncing with the InfiniSync “black box” to retain any replication updates that might be lost due to a data center disruption. This eliminates the third data center (aka “bunker busting”) and provides the effect of synchronous replication over any distance with a Recovery Point Objective (RPO) of Zero = NO DATA LOSS. 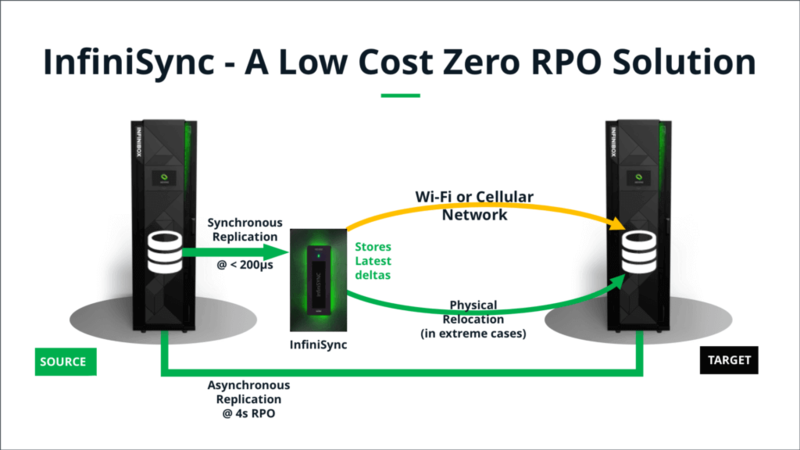 The InfiniSync is a ballistically hardened data appliance and the world’s first solution for zero RPO synchronous data mirroring over virtually infinite distance able with withstand almost any disaster. For organizations dealing with highly sensitive and critical data and systems—banking or healthcare, for instance—InfiniSync eliminates the complexity, costs and performance issues of traditional storage data protection. Multi-petabyte storage needs multi-petabyte data protection. To that end, we’ve also developed InfiniGuard. 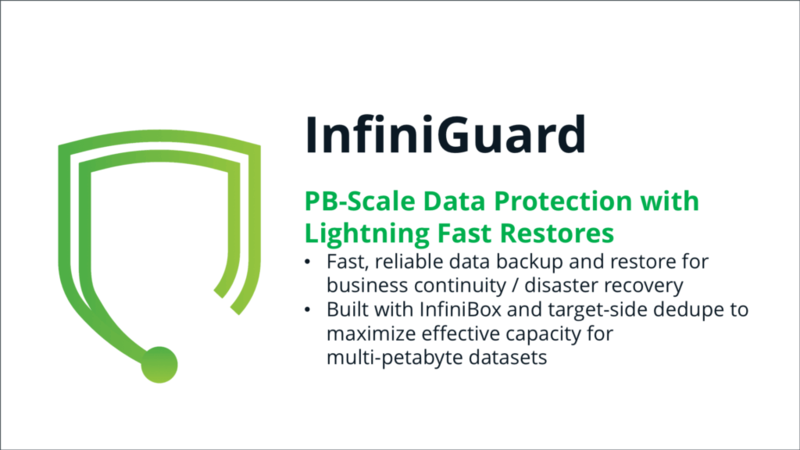 InfiniGuard leverages all the same technology and features found in the InfiniBox, combined with industry standard deduplication, to store up to 20 petabytes of data in a single 42U rack. By leveraging the InfiniBox, the InfiniGuard delivers the same high availability, ensuring data restores are fast and reliable when needed. We’ve also taken steps with InfiniGuard to provide support for a rich software ecosystem including Commvault, Veeam, VMware, Veritas, IBM Spectrum Protect, SAP, Oracle RMAN, and Microsoft Exchange. By doing the work to integrate with the most popular backup applications and software ecosystems, our customers can leave behind their legacy vendors and move over to a partner that understands what data protection at scale means. In addition to data protection, some of the most common issues facing enterprise organizations have to do with the cloud: when to use it, what the right cloud strategy is and how exactly to implement it. 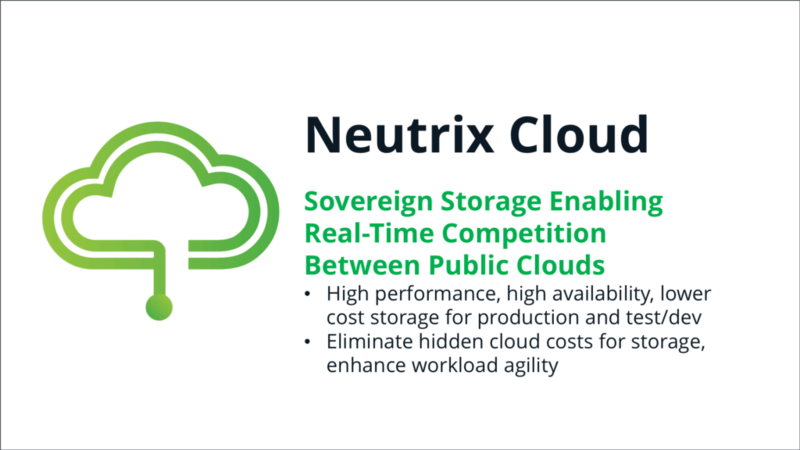 With the Neutrix Cloud, we aim to truly deliver on the promise of the agility of the public cloud without driving up infrastructure complexity and cost. 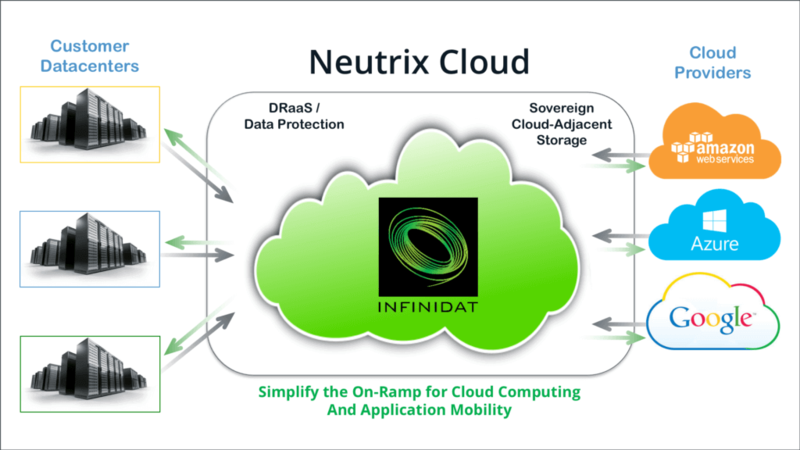 Neutrix Cloud is a sovereign public storage cloud, offer enterprise organizations extremely high performance, multi-petabyte cloud file systems and volumes, that are simultaneously accessible from Google, Azure and AWS compute clouds. That was a LOT to unpack. Thanks for hanging in there. Finally, here are the GA dates for everything we’re announcing—InfiniBox F6212 and InfiniSync will all be generally available as of April 2, 2018. 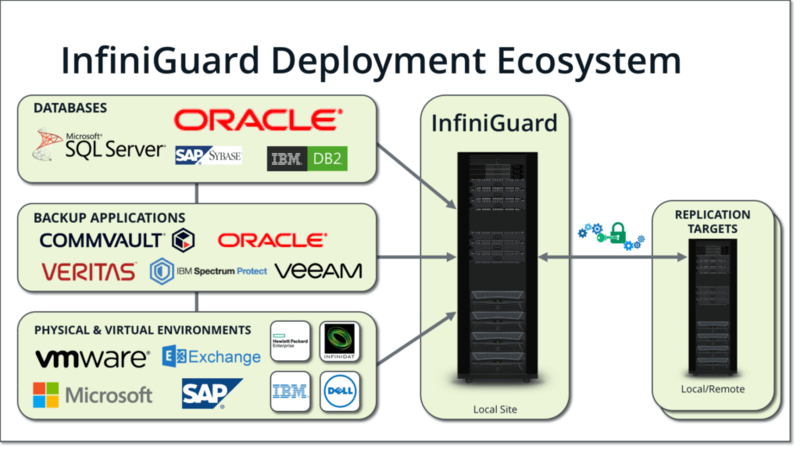 InfiniGuard is available immediately. Neutrix Cloud will be generally available the end of April in US-East and US-West regions, with global regions coming online in the future. To learn more about INFINIDAT and all of our new solutions, visit our home page, read the press release or contact us to see a demonstration.